Post Profit Stats: a freemium service with lots of features for you to use to reward your writers. You can track up to 50 authors, set custom payment amounts for each author, and even store the data in a separate database. 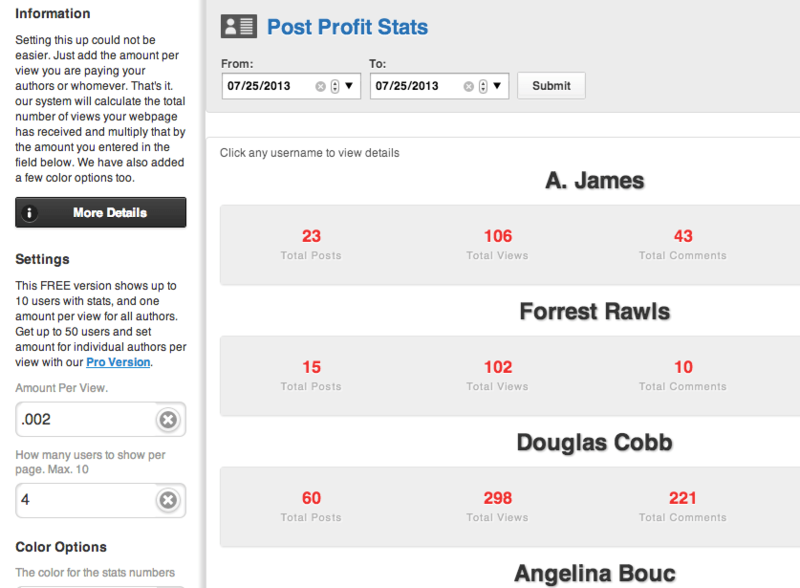 Post Pay Counter: tracks author stats and calculates pay for multi-author blogging businesses. You can set payment values and award bonuses easily. Author Page Views: designed to help CPM monetized content publishers to track individual authors and compensate them based on their performance. Your authors will be able to see their pageviews too. Whether you should pay your authors a fixed amount per post or based on pageviews is up to you. The above plugins track author statistics to make your job easier.